Ghasemi, H., Asghari Asl, S., Yarmohammadi, M., Jafari, F., Izadi, P. (2017). External Dacryocystorhinostomy; Success Rate and Causes of Failure in Endoscopic and Pathologic Evaluations. Iranian Journal of Pathology, 12(3), 189-194. Hassan Ghasemi; Sajedeh Asghari Asl; Mohammad Ebrahim Yarmohammadi; Farhd Jafari; Pupak Izadi. "External Dacryocystorhinostomy; Success Rate and Causes of Failure in Endoscopic and Pathologic Evaluations". 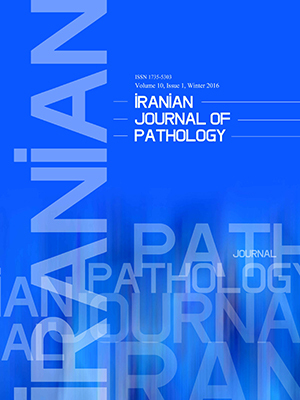 Iranian Journal of Pathology, 12, 3, 2017, 189-194. Ghasemi, H., Asghari Asl, S., Yarmohammadi, M., Jafari, F., Izadi, P. (2017). 'External Dacryocystorhinostomy; Success Rate and Causes of Failure in Endoscopic and Pathologic Evaluations', Iranian Journal of Pathology, 12(3), pp. 189-194. Ghasemi, H., Asghari Asl, S., Yarmohammadi, M., Jafari, F., Izadi, P. External Dacryocystorhinostomy; Success Rate and Causes of Failure in Endoscopic and Pathologic Evaluations. Iranian Journal of Pathology, 2017; 12(3): 189-194. Background and Objectives: External dacryocystorhinostomy (DCR) is the method of choice to treat nasolacrimal duct (NLD) obstruction and the other approaches are compared with it, with a failure rate of 4% to 13%. The current study aimed to assess the causes of failure in external DCR by postoperative endoscopic and pathological evaluation. Methods: The current retrospective cross sectional study followed-up113 patients with external DCR and silicone intubation for three months. Silicone tubes were removed after the third months. Failure was confirmed based on the clinical findings and irrigation test. Paranasal sinus computed tomography (CT) scanning, and endoscopic and pathological evaluations were performed in the failed cases. Results: Totally, 113 patients underwent external DCR. The patients included 71 females and 42 males. The mean age of the patients was 55.91 years; ranged from 18 to 86. Epiphora was the most common complaint before surgery (90.3%). Clinically, epiphora continued in 17 cases (15%), of which 94.11% had at least one sinus CT abnormality and 82.35% had at least one endoscopic abnormality. The most common endoscopic findings were deviated septum (70.6%), scar tissue (52.94%), concha bullosa (46.9%), septal adhesion (47.05%), enlarged middle turbinate (41.2%), and sump syndrome (11.7%). The failure was significantly associated with the chronicity of the initial symptoms (P-value=0.00). Pathologically, there were significant relationship amongst the failure rate, scar formation, and allergic rhinitis (P-values =0.00 and <0.05, respectively). Conclusion: Preoperative endonasal evaluation and consultation with an otolaryngologist can improve surgical outcomes and help to have a better conscious to intranasal abnormalities before external DCR surgery. Majority of patients, who had failed external dacryocystorhinostomy (DCR) surgery, have at least one sinus CT or endoscopic or pathologic abnormality. These abnormalities were septal deviation, scar formation, concha bullosa, septal adhesion, enlarged middle turbinate and sump syndrome. Pathologically, there were significant relationships between the failure rate and scar formation and allergic rhinitis. In DCR surgery, Preoperative endonasal evaluation and consult with an otolaryngologist are highly recommended. 1. raujoFilho BC, Voegels RL, Butugan O, PinheiroNeto CD, Lessa MM. Endoscopic dacryocystrhinostomy. Braz J Otorhinolaryngol 2005 Nov;71(6):721-5. 2. Sibley D, Norris JH, Malhotra R. Management and outcomes of patients with epiphora referred to a specialist ophthalmic plastic unit. Clin Experiment Ophthalmol 2013 Apr;41(3):231-8. 3. Saha R, Sinha A, Phukan JP. Endoscopic versus external approach dacryocystorhinostomy: A comparative analysis. Niger Med J 2013 May;54(3):165-9. 4. Ozer S, Ozer PA. Endoscopic vs external dacryocystorhinostomy-comparison from the patients' aspect.Int J Ophthalmol 2014 Aug 18;7(4):689-96. 5. Mekonnen W, Adamu Y. Outcome of external dacryocystorhinostomy in Ethiopian patients. Ethiop Med J 2009 Jul;47(3):221-6. 6. Cokkeser Y, Evereklioglu C, Er H. Comparative external versus endoscopic dacryocystorhinostomy: results in 115 patients (130 eyes). Otolaryngol Head Neck Surg 2000 Oct;123(4):488-91. 7. Francisco FC, Carvalho AC, Francisco VF, Francisco MC, Neto GT. Evaluation of 1000 lacrimal ducts by dacryocystography. Br J Ophthalmol 2007 Jan;91(1):43-6. 8. Savino G, Battendieri R, Traina S, Corbo G, D'Amico G, Gari M, et al. External vs. endonasaldacryocystorhinostomy: has the current view changed? ActaOtorhinolaryngolItal 2014 Feb;34(1):29-35. 9. Ali MJ, Naik MN, Honavar SG. External dacryocystorhinostomy: Tips and tricks. Oman J Ophthalmol 2012 Sep;5(3):191-5. 10. Duggal P, Chakravorty S, Azad RK, Mohan C. An epidemiological study on patients undergoing dacryocystorhinostomy. Indian J Otolaryngol Head Neck Surg 2006 Oct;58(4):349-51. 11. Thornton SP. Nasolacrimal duct reconstruction with the nasolacrimal duct prosthesis: an alternative to standard dacryocystorhinostomy. Ann Ophthalmol 1977 Dec;9(12):1575-8, 1581. 12. El-Guindy A, Dorgham A, Ghoraba M. Endoscopic revision surgery for recurrent epiphora occurring after external dacryocystorhinostomy. Ann OtolRhinolLaryngol 2000 Apr;109(4):425-30. 13. Ben Simon GJ, Joseph J, Lee S, Schwarcz RM, McCann JD, Goldberg RA. External versus endoscopic dacryocystorhinostomy for acquired nasolacrimal duct obstruction in a tertiary referral center. Ophthalmology 2005 Aug;112(8):1463-8. 14. Choussy O, RetoutA, Marie JP, Cozlean A, Dehesdin D. Endoscopic revision of external dacryocystorhinostomy failure. Rhinology 2010 Mar;48(1):104-7. 15. Elmorsy SM, Fayk HM. Nasal endoscopic assessment of failure after external dacryocystorhinostomy. Orbit 2010 Aug;29(4):197-201. 16. Korkut AY, TekerAM, Ozsutcu M, Askiner O, Gedikli O. A comparison of endonasal with external dacryocystorhinostomy in revision cases.Eur Arch Otorhinolaryngol 2011 Mar;268(3):377-81. 17. Liang J, Hur K, Merbs SL, Lane AP. Surgical and anatomic considerations in endoscopic revision of failed external dacryocystorhinostomy. Otolaryngol Head Neck Surg 2014 May;150(5):901-5. 18. Shrestha S, Kafle PK, Pokhrel S, Maharjan M, Toran KC. Successes rate of endoscopic dacryocystorhinostomy at KMC. Kathmandu Univ Med J (KUMJ ) 2010 Apr;8(30):195-8. 19. Szubin L, Papageorge A, Sacks E. Endonasal laser-assisted dacryocystorhinostomy. Am J Rhinol 1999 Sep;13(5):371-4. 20. Lee BJ, Nelson CC, Lewis CD, Perry JD. External dacryocystorhinostomy outcomes in sarcoidosis patients.OphthalPlastReconstrSurg 2012 Jan;28(1):47-9. 21. Boboridis KG, Bunce C, Rose GE. Outcome of external dacryocystorhinostomy combined with membranectomy of a distal canalicular obstruction. Am J Ophthalmol 2005 Jun;139(6):1051-5. 22. Keerl R, Weber R. [Dacryocystorhinostomy - state of the art, indications, results]. Laryngorhinootologie 2004 Jan;83(1):40-50. 23. Eyigor H, Unsal AI, Unsal A. The role of accompanying sinonasal abnormalities in the outcome of endonasaldacryocystorhinostomy. Am J Rhinol 2006 Nov;20(6):620-4. 24. Golan S, Leibovitch I, Landsberg R. Unexpected pathologies in patients referred for endoscopic DCR. Eur Arch Otorhinolaryngol 2014 Nov;271(11):3053-8. 25. Fayet B, Racy E, Assouline M. Complications of standardized endonasaldacryocystorhinostomy with unciformectomy. Ophthalmology 2004 Apr;111(4):837-45.